Radiofrequency ablation is a therapy that uses radio waves to create an electrical current. This current delivers heat to targeted nerve tissues, in an attempt to reduce chronic pain symptoms that are associated with various conditions. The way the heat is applied to the nerve tissue impairs or destroys the nerves, resulting in a semi-permanent disturbance of the transmission of pain signals from the spinal column to the brain.Radiofrequency ablation is a non-surgical therapy that was initially discovered to be an effective treatment for the relief of chronic pain in 1931 when it was utilized to treat a patient with trigeminal neuralgia, which is a pain condition that affects facial nerves, resulting in severe jolts of pain. Due to the treatment benefits of this procedure, radiofrequency ablation has become increasingly popular for both physicians and patients over the past 15 years. Numerous reports have shown that radiofrequency ablation leads to a greater reduction in spinal pain compared to conventional treatment options, due to the disruption of nerve function that occurs with this procedure. Further, the reports have suggested that the pain reduction is sustained for six to 12 months after the procedure is performed. There are additional benefits of this treatment that may also contribute to the appeal of this procedure for physicians and patients. These benefits include being able to perform the procedure in an outpatient environment, needle insertion precision, and being able to repeat the procedure if needed. At the present time, radiofrequency ablation is frequently used to treat lumbar facet joint pain. The facet joints are located within the spine and connect the vertebrae to one another. Within the facet joints are medial branch nerve networks, which are responsible for transmitting pain signals to the brain when there is nerve tissue damage or inflammation. When a patient’s pain becomes persistent, radiofrequency ablation is usually performed to destroy the affected medical branch nerve, which helps to relieve or eliminate the patient’s pain. Additionally, radiofrequency ablation has been used successfully to treat other conditions, including arthritis pain, lumbar spine pain, and cervical facet joint pain. The radiofrequency ablation procedure is performed in an outpatient setting and requires minimal pharmacologic intervention. Prior to initiating the procedure, the physician will address any concerns and acknowledge any complications that may occur during the procedure. Patients are discharged within a few hours after the completion of the procedure, making this relatively quick. MUST WATCH VIDEO – RADIOFREQUENCY ABLATION PERFORMED LIVE! In an effort to decrease discomfort during a radiofrequency ablation procedure, an anesthetic and possibly a mild sedative are given to the patient via an intravenous line. After the anesthetic has numbed the area sufficiently, the physician inserts a needle into the area of the spinal column where the nerves that are causing the pain are located. Usually, the patient is placed in a prone position for this procedure; however, if the affected nerves are located in areas such as the neck, the patient may lie in a supine position. 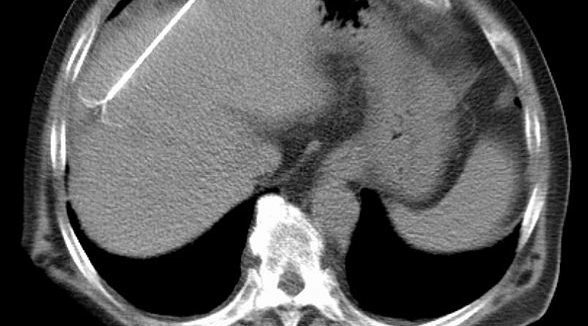 Imaging techniques, including X-ray or fluoroscopic guidance, are utilized during radiofrequency ablation to help guide the needle and ensure proper needle insertion. After proper needle insertion is complete, a microelectrode is inserted through the needle. While the microelectrode is positioned, a very small electric current is initiated, which produces a tingling sensation. The patient is asked if they can feel the tingling while the physician observes both motor and sensory stimulation in the patient. This helps to ensure that the microelectrode is positioned properly. It is imperative that the nerve responsible for creating pain is treated during this procedure as opposed to motor nerves. Therefore, mild electrical stimulation is also used to confirm that the large muscle groups are not being stimulated by the treatment. This electrical stimulation may result in undesired effects, such as twitching and throbbing; however, it is necessary as it provides the physician with an indication of areas that they should avoid to prevent damage to motor nerves. Once the radiofrequency ablation procedure is complete, patients are monitored for adverse reactions, including motor deficits, paralysis, muscle weakness, and severe pain. Patients are advised to have someone drive them home after the procedure and to use caution when returning to regular activities because mild soreness and pain may develop during their recovery period. Moreover, it can take up to one month for damaged nerves to lose their functioning completely, and during this time, mild pain may be experienced by the patient. Until the nerve functioning is completely lost, patients may continue to experience symptoms such as muscle weakness. It can therefore be necessary for the physician to prescribe analgesic medication to help the patient manage their pain and discomfort during their recovery period. Continuous radiofrequency and pulsed radiofrequency are the two types of radiofrequency that are used in ablation procedures. Continuous radiofrequency was developed in 1931, and pulsed radiofrequency was developed in the 1970s. The frequency of the current used in continuous radiofrequency is gradually increased until the electrode temperature is between 50° and 80°C (122° and 176° F). This temperature is maintained for 80 to 90 seconds, which is approximately the length of time required for the heat to cause nerve damage.To increase the likelihood of causing the nerve to be completely cut, multiple sites along a nerve are often exposed to the heat. As a result of the heat that is generated by the electrodes, the nerve’s ability to transmit pain signals is reduced. This procedure can take approximately one to two hours, depending on the injection site position as well as the number of nerves that need to be targeted for treatment. Pulsed radiofrequency carries advantages compared to continuous radiofrequency ablation procedures, including a reduced degree of nerve injury and a reduced need for anesthetic medication during the procedure. Furthermore, the pulsed radiofrequency approach results in fewer cases of pain after the procedure, reduced scarring, and it can be utilized for various sites and conditions that would be inappropriate for the continuous radiofrequency approach. An example of this is the treatment of certain neuropathic pain conditions, including trigeminal neuralgia. This condition is the result of nerve injury and therefore using a continuous approach to treatment would result in further nerve damage and potentially worsen the patient’s symptoms. In these cases, it is more advantageous to block the pain signals by stunning the nerves through a pulsed radiofrequency procedure. MUST WATCH VIDEO – CERVICAL RADIOFREQUENCY ABLATION PERFORMED LIVE! 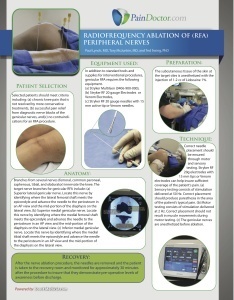 Radiofrequency ablation procedures are associated with various risks, including permanent nerve damage and infection. If an infection develops, hospitalization and the administration of intravenous (IV) antibiotics, as well as surgery may be necessary.A radiofrequency ablation procedure is not appropriate in patients with active infections (e.g. a cold or sinus infection), or for patient’s with blood clotting issues, or for those who may be pregnant. Further, this procedure is not appropriate for patients weighing more than 250 pounds. Diabetic patients need to have their insulin dose adjusted on the day of the procedure. Patients who have poorly controlled diabetes or those who have heart conditions and that need to take blood-thinning medication (e.g. aspirin) on a daily basis need to get medical clearance from their physician to stop taking the medication for one week. Additionally, non-steroidal anti-inflammatory drugs (NSAIDs), such as ibuprofen, need to be stopped for a minimum of 24 hours, but preferably 72 hours, prior to the procedure. NSAIDs need to be discontinued as they can affect the blood clotting process, which can result in serious bleeding complications. Furthermore, taking corticosteroids, such as prednisone, methylprednisolone, and cortisone, regularly can aggravate and complicate symptoms that are caused by inflammation of nerves. Radiofrequency ablation is associated with a number of side effects, including minor bleeding, swelling, skin discoloration, and bruising at the needle insertion site. These side effects generally subside during the first few days after the procedure. Additionally, some patients may experience leg numbness; however, this side effect usually only lasts for a couple of hours and may actually be the result of the anesthetic used during the procedure. If a patient experiences leg numbness, they should receive assistance when they try to walk or move around.During the procedure, the electrode is positioned extremely close to the targeted nerves and this may result in a temporary increase in pain that may extend into the extremities. However, the anesthetic that is administered during this procedure is meant to reduce the amount of discomfort and pain that is experienced as the result of this procedure. Blood vessels and motor nerves that are located near the targeted nerves may also be injured during a radiofrequency ablation procedure. Further, the electrical current that passes through the electrode may result in a burn, however, this rarely occurs. When the anesthetic wears off, the patient may experience mild back pain around the injection site. This pain usually resolves within 48 to 72 hours and can be treated with over-the-counter pain medication, as well as cold packs on the day of the procedure, and hot packs from the second day onward, until the pain resolves. Some patients may experience slightly increased pain for approximately one to two weeks after the treatment, which should gradually decrease. Patients who undergo a continuous radiofrequency ablation procedure may have pain for up to one month after the procedure as the procedure causes lesions on the nerves but it can take this length of time for the targeted nerves to die. However, the pain that a patient experiences after a radiofrequency ablation procedure should not be as severe as the pain they had prior to the procedure. Side effects that are experienced by patients after a radiofrequency ablation procedure should be closely monitored, as they may be the first signs of a serious adverse reaction. For example, pain at the site of the injection should not be severe; additionally, if it occurs with swelling, redness, and paralysis or leg weakness, the patient should seek medical attention immediately as more serious complications such as bleeding may be the source of the symptoms. Moreover, a fever of more than 100.4°F, or fluid draining from the injection site may be indicative of a developing infection that requires immediate medical attention. Although radiofrequency ablation is associated with a number of side effects, it has been proven to be a safe and effective treatment option for chronic pain. Reports have also shown that radiofrequency ablation is well-tolerated by most patients and that complications are rare. Patients suffering from chronic pain symptoms that have not experienced relief from conservative treatment options including physical therapy, non-steroidal anti-inflammatory drugs (NSAIDs), corticosteroid injections, or epidural injections, may need to undergo more invasive treatment procedures. A qualified physician at a pain management clinic will be able to determine if a patient is an ideal candidate for a radiofrequency ablation procedure. Typically, before deciding if a patient is suitable for radiofrequency ablation, the physician will want to know how long they have utilized conservative treatment options for. For example, if a patient’s pain is unresponsive to medications and exercise after six weeks, they will want to know if other conservative treatments, including physical therapy or chiropractic care, were utilized for a minimum of four to six months prior to being referred to a pain clinic.Once the patient is referred to a pain clinic for the treatment of their chronic pain symptoms, they may be treated with corticosteroid injections for a minimum of three months to determine if this form of therapy will provide pain relief. If corticosteroid injections fail to provide pain relief, then medial branch blocks will be performed. A medial branch block is a type of nerve block where a needle is inserted into the area of the spinal column where the affected nerve roots are located. Fluoroscopy or X-ray is used to visualize proper needle placement for the procedure. Once proper needle placement is confirmed, a catheter is inserted through the needle, which delivers the pain medication to the nerves that are believed to be causing the chronic pain. A corticosteroid and anesthetic, or a substance that dissolves nerve tissue, is injected. This treatment method is believed to provide extended pain relief by blocking pain signal transmission. If the patient reports pain relief from a minimum of two diagnostic medical branch blocks, then radiofrequency ablation will be recommended for the management of their pain. Studies have indicated that radiofrequency ablation that is utilized for the treatment of lower back pain is associated with a significant decrease in pain severity that is sustained for one to two years in the majority of patients that undergo this procedure. Moreover, the pain relief reported after radiofrequency ablation treatment is reported to be much more significant and longer lasting compared to corticosteroid injections. Some patients that were treated with spinal surgery also reported more significant pain relief, improved range of motion, improved quality of life, reduced recovery time, and a decreased need for analgesic medication after receiving radiofrequency ablation therapy. Some patients who had spinal surgery prior to undergoing radiofrequency ablation therapy did not experience the same level of pain relief as patients with low back pain that did not have surgery prior to the ablation treatment. This indicates that spinal surgery may occasionally cause nerve damage that interferes with the effectiveness of radiofrequency ablation. For example, when untargeted nerves become damaged during treatment, such as motor nerves, deafferentation pain may result, and cause a patient’s pain symptoms to worsen. If this occurs, the pain resulting from the spinal surgical procedure will not be improved with ablation therapy. The sphenopalatine ganglion is a cluster of nerves that provide touch and pain sensations to the head and face region. When this cluster of nerves becomes irritated or inflamed, a patient may experience facial pain and chronic headaches. Damage to the sphenopalatine ganglia can result in muscle deficits, and even paralysis. Reports have indicated that pulsed radiofrequency ablation to treat chronic headaches and other conditions that may be causing atypical facial pain, can provide patients with relief of mild to moderate pain for up to one year, and in some patients may provide complete pain relief. In addition to the pain relief benefits, patients have reported a decreased need for opioids, and the elimination of complications such as infection, bleeding, fluid retention around the injection site, swelling, and numbness. The clinical studies that have been conducted suggest that a pulsed method for radiofrequency ablation is more effective for treating nerve pain in sensitive areas such as the face and head as opposed to a continuous approach. Radiofrequency ablation is a non-surgical therapy that is minimally invasive that has been found to be one of the most precise treatments for the management of chronic pain symptoms. The procedure results in the temporary destruction of the nerves that are responsible for pain symptoms through the use of an electrical current that creates heat in the area where the inflamed nerves are located. The heat that is generated causes lesions along the nerve, which leads to a loss of nerve function and the disruption of transmission of pain signals from the spinal cord to the brain. The result is significant pain reduction after the procedure.Radiofrequency ablation therapy is used to treat a wide variety of conditions. In addition to pain relief, patients have also reported reduced recovery times, improvement in quality of life, increased range of motion, and the decreased need to take pain medications when compared to more conservative treatment options such as physical therapy and steroid injections, as well as surgery.